Russia's neighbours and partners around the globe are taking a close look at First Deputy Prime Minister Dmitry Medvedev. They're looking for clues about how Russia would behave on the world stage with Medvedev at the helm. At the World Economic Forum in Davos in January 2007, Medvedev gave his views on foreign policy and his vision of Russia's place on the world stage. I believe democracy doesn't need any additional definitions, because humankind knows what democracy is and is able to distinguish real political democracy and the use of this word for hiding existing problems. So I think that when the concept of democracy is added to other adjectives it makes some analysts and commentators think it's more of a surrogate democracy. Despite my confidence in the existence of real democracy in Russia, to my mind this play on words doesn't really mean much. What matters is the real political situation in the country. “We aren’t trying to push anyone to love Russia, but we won't allow anyone to hurt Russia. We'll strive to win respect both for the citizens of Russia and for the country as a whole. Moreover, this shall be achieved not by using force but rather by our own behaviour and by our achievements,” Medvedev said. And Medvedev's views on economics chime with those of western governments. “In the 21st century we see Russia as a developed country with strong economy and as a reliable trade and political partner,” he said. Asked about continuity of government in Russia, Medvedev said that the difference between democratic and undemocratic states was that in the former there was “continuity of policy”. “It's very important because it lets us build international relations on a long-term basis,” he said. in his opinion the world today is so interconnected that one can not expect any unpredictable shifts in the policies of different countries, even when political elites are changing. The MICEX index, Russia's stock market, reacted favourably to news the Putin was backing Medvedev for president. It reached record highs with shares in gas giant Gazprom leading the way. 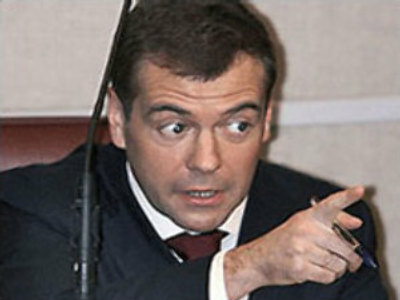 Medvedev is Chairman of the Board of Directors at Gazprom. Speaking in Davos about energy security, Medvedev said Russia would protect exports. He pointed out that Russia’s efforts in recent years were aimed at setting clear and stable rules in the energy markets. He said the priority was eliminating non-transparent and unjustified systems of price determination with transit countries. “Being part of global economy, we have to accept rules that are already introduced in the world. This means there will no more free natural gas for anyone,” Medvedev said.